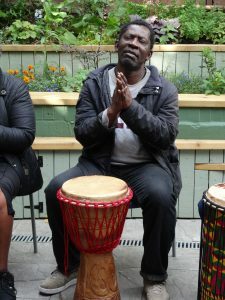 This project is delivered in partnership with Ashford Place and supported with a Culture Seeds grant, administered by Groundworks. 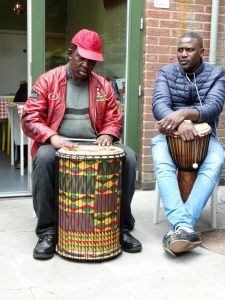 Cultural Connections delivery will be based at Ashford Place, Cricklewood with delivery spanning September 2018- June 2019. Larger public events will be taking place to mark significant celebrations during this period, such as World Commonwealth day in March 2019. 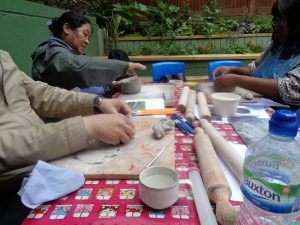 Participants in this project will have the chance to take part in a range of creative activity, including African drumming sessions, pottery classes, creative writing and textile crafts. Through these activities stories will be shared and art forms and techniques from different cultures will be explored. This seeks to breakdown barriers, enhance understanding and promote stronger relationships with in the community. From this, new friendships will grow. 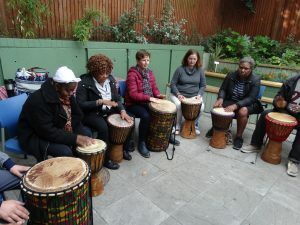 The project has launched with a weekly provision of African drumming over September 2018 with 17 participants taking part, including attendees of the Ashford Place Well-being group. 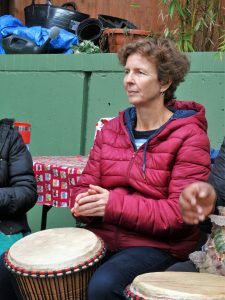 During the African Drumming sessions participants were introduced to the drums and the different ways of playing them. 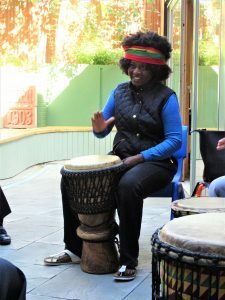 As sessions progressed and their confidence grew, they were encouraged to move to the rhythm and explore beaters and traditional African chants to develop the performance. Conversation about where in Africa, generated general discussion on people’s backgrounds and heritage, as well as discussing some traditional customs of Africa. As a result many personal exchanges were shared amongst the group and they’ve enjoyed the chance to get to know each other. 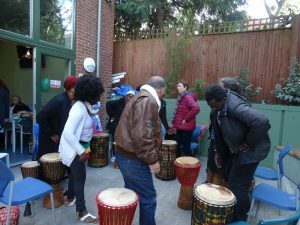 As trust and skills increased, the group played together performing separate parts that combined to create impressive rhythm. Dance and movement was enjoyed as we moved to the collective beat and celebrated all we had learnt during these workshops. 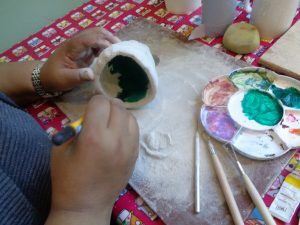 Over October 2018, weekly pottery classes are being delivered at Ashford Place. 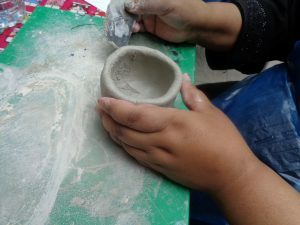 Participants are learning the basic techniques of pinch pot and coil pot making, before exploring adding decorative details, inspired by African pattern. This activity focused on the collaborative creation of a heritage themed patchwork wall hanging, exploring flags and maps. Workshops will begin again in January 2019.